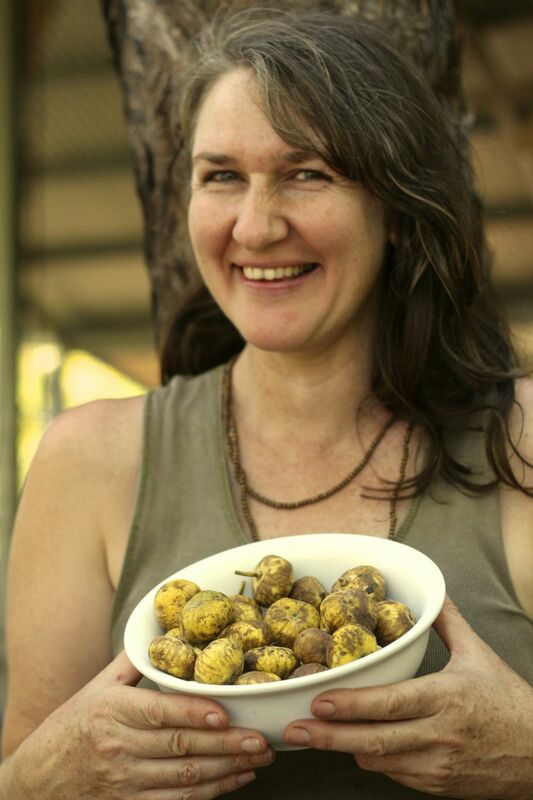 The GULP NT project has recently starting focussing on bush tucker and wild foods (wild food also included feral animals and weeds) and developing ways of making these interesting plant parts and creatures into delicious dishes. Before the recent wild food gathering members of the group harvested wild foods either individually or with others and brought them together. 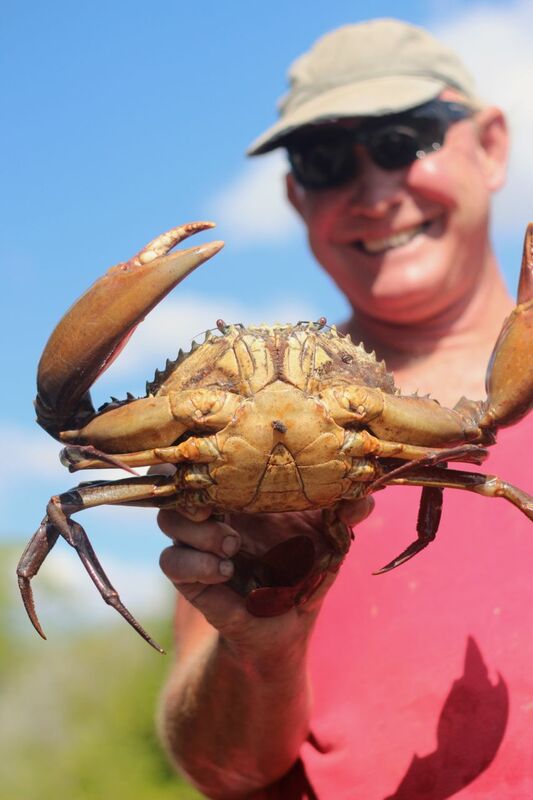 The harvest included many Mud crabs, mud mussels, periwinkles and long bums. These were collected in the very amazing Adelaide River Mouth with environmentalist, local seafood enthusiast and friend Llyod. The expedition took all day but was very worth it. 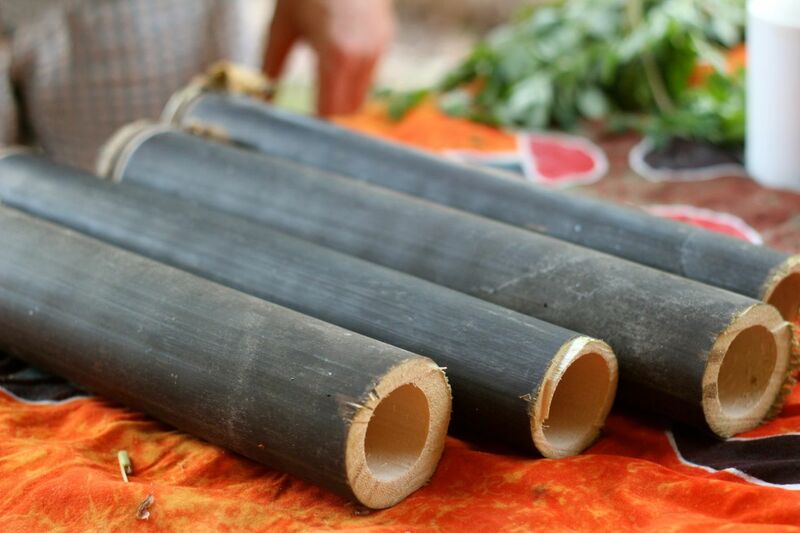 Longbums, loved also by indigenous people are amazing food in a cone-shaped shell with the very awesome scientific name Telescopium Telescopium. 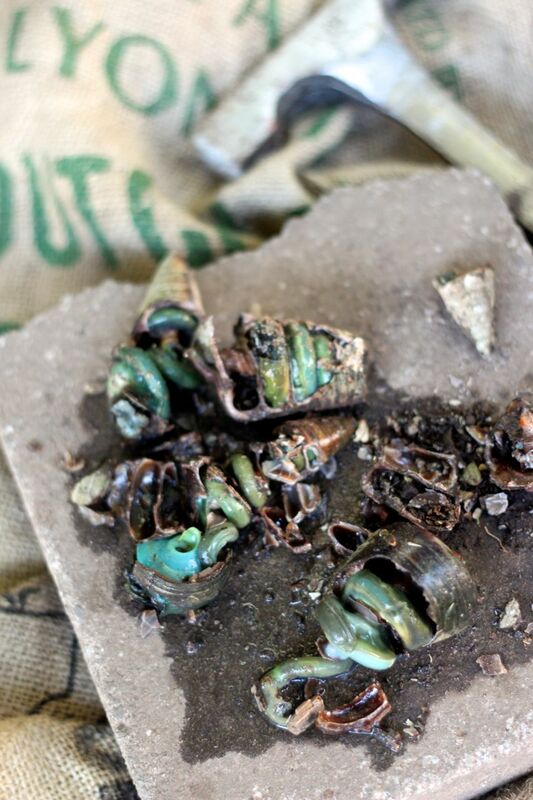 They are found amongst a variety of brackish mangroves in the mud and once cooked turn a wild green colour. They can be boiled or cooked in the coals and then need to be smashed out of their shells. We cooked them up, once shelled in coconut lemongrass, ginger and chilli with home made coconut milk from foraged coconuts from Coconut Grove. The main focus of our sea food harvest was the delicate and specialised mud mussel ( Polymesoda erosa or Jukwarringa in Tiwi). 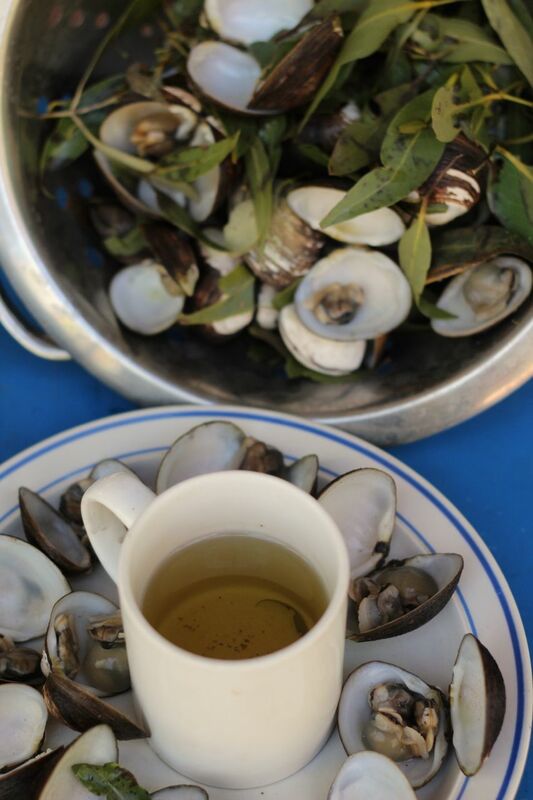 Once boiled for a short time they open revealing a salty and watery small shell fish which really is delicious. These are mostly found amongst the roots coming up from the mud of the Grey Mangrove, Avicennia marina and are best picked when buried far in the mud and harder to spot. This is the tidal zone, so you have to get in at low tide and you may end up as a mud monster. We also picked up a few periwinkles found on the Stilt mangroves or Rhizophoro. The mud mussels are best just steamed in a pan until they open. 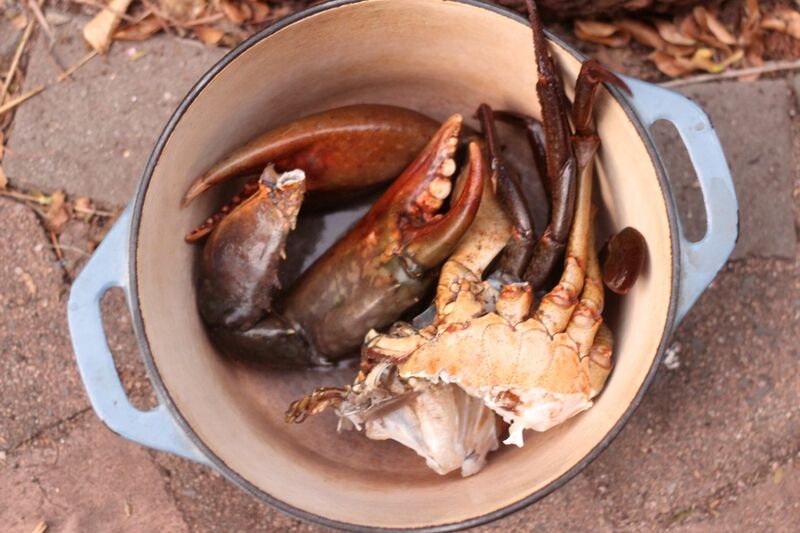 They can be cooked with the leaf of the Grey Mangrove, and this boiled with water is quite tasty as a tea. A little note on sustainable harvest- Whenever collecting wild food you need to only take as much as you need, always leave more than you take so the plant or animal can reproduce. If the animal or plant is feral/ a weed then this rule does not apply and you help the native environment by taking the produce. 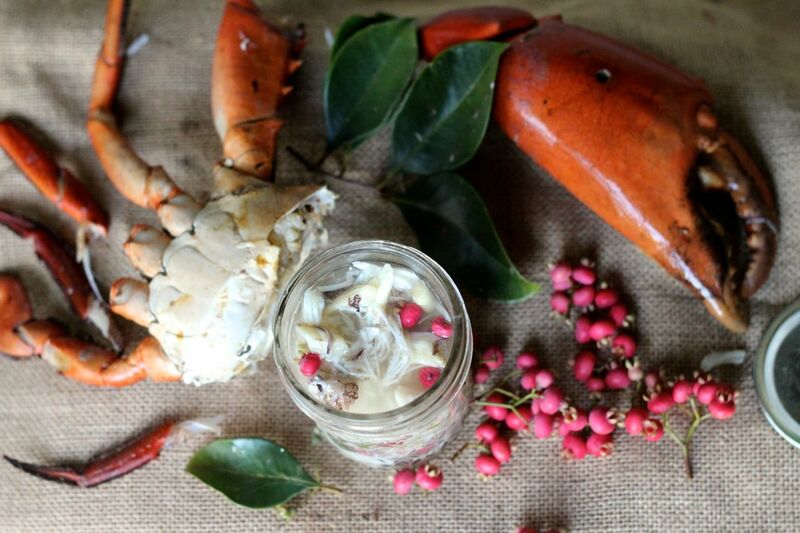 On our sea journey we also put crab pots down and came back with some juicy mud crabs. We made sure all were big enough and put all females back. Road kill wallaby also featured on the menu. This needs to be fresh, skinned and gutted and can then be frozen for later. It is very sad that many animals are hit by cars, but if you can eat them then there is less waste and to a point the meat had a natural and free life before the unfortunate end. Lou took a technique often used in Asia and after cutting up the meat mixed with a variety of herbs and flavourings including lemongrass, ginger and chilli. 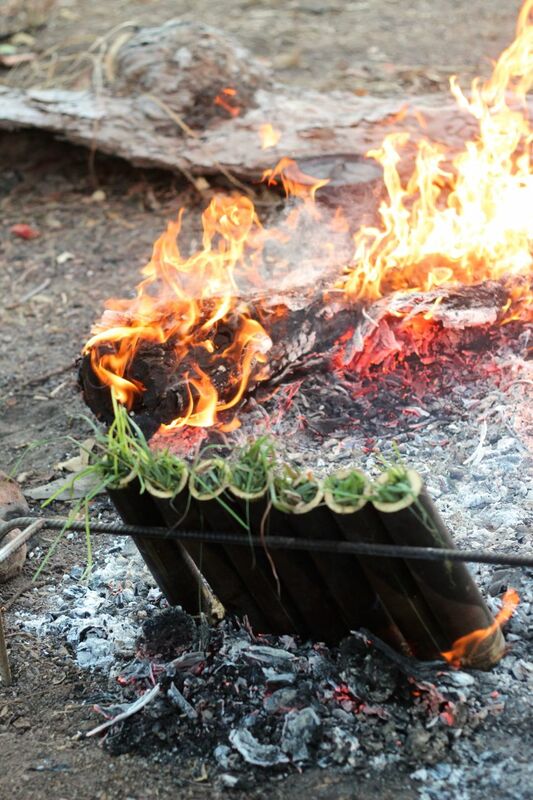 This was then stuffed into the bamboo tubes and placed in the coals out of the flames of the fire and sort of steamed. Cluster figs were collected by Grusha from Casaurina coastal reserve, they seem to be just getting ready here and all over the riverine margins. They grow on the stem and branches of this tree (Ficus racemosa) and change to an orangey colour when ready. They have a slightly fluffy texture with the hint of sweetness, but to be honest are not that delicious off the tree. Grusha made these into incredible syrup by stewing them in water in a slow cooker with sugar and spices for a couple of hours. These were so good. 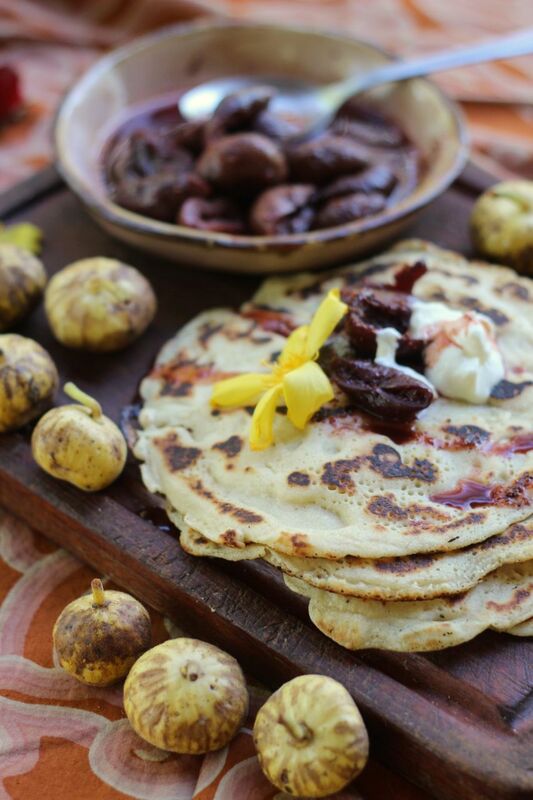 These were cooked up and a served on pancakes with yoghurt and kapok flowers. 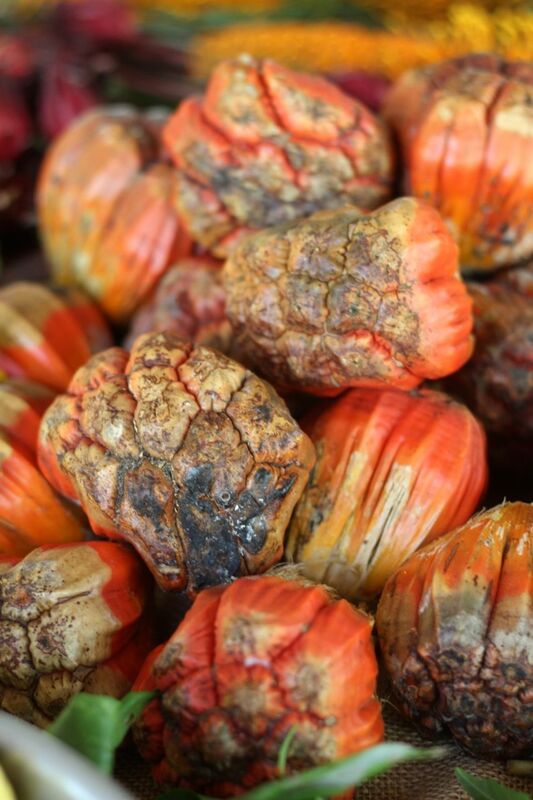 Pandanus nuts, were cooked on the coals and broken open, but with not much success, the seed seemed to be a little hard to get out, we might need to get a little more advice on this one from our Yolngu family. 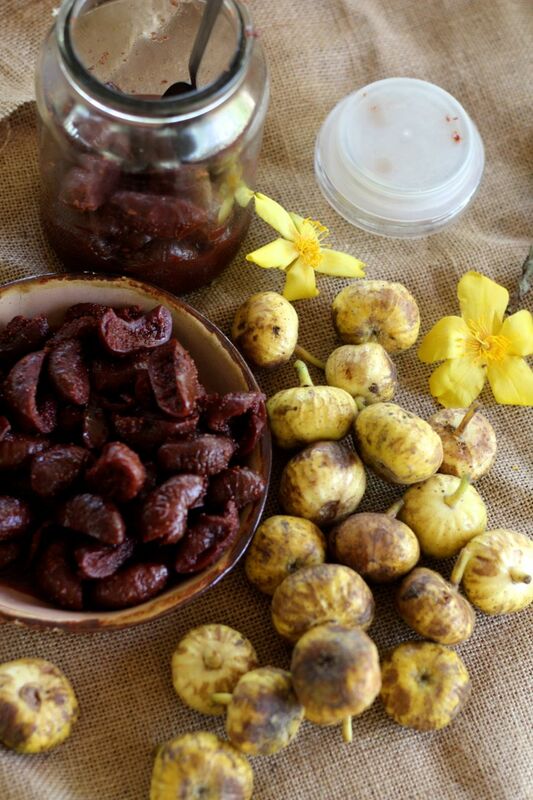 Kakudu plum- Terminalia ferdiandiana (frozen and pickled as just out of season) was bought along. The fruit seemed pretty tasty and less stringy frozen. The pickles, preserved in vinegar, sugar and spices were very tasty. 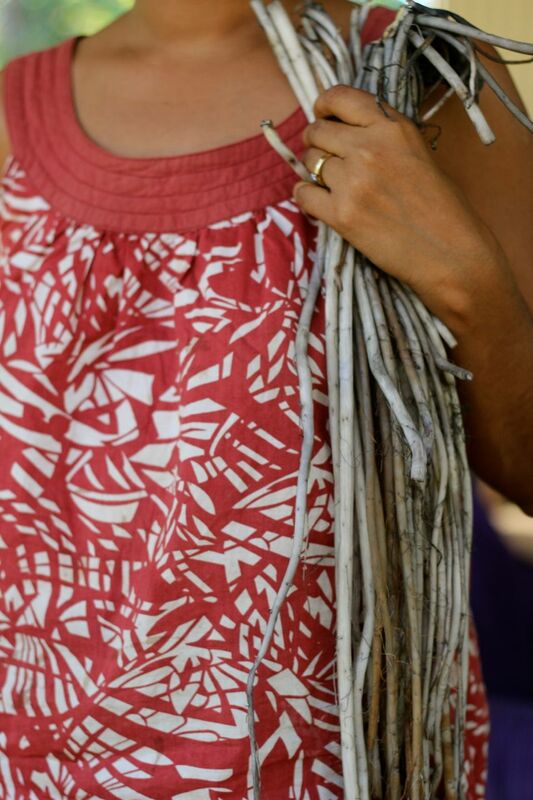 It had been picked in May from the bush on the outskirts of Darwin. Local Yam root (Dioscorea sp.) was carefully peeled, this took a while as it is very hobbly boobly. This ha been grown in Grusha’s garden, originally collected from the bush. This is the time to harvest them, in unburnt bush so the leaves can be seen. The later in the dry season the foliage dies back. 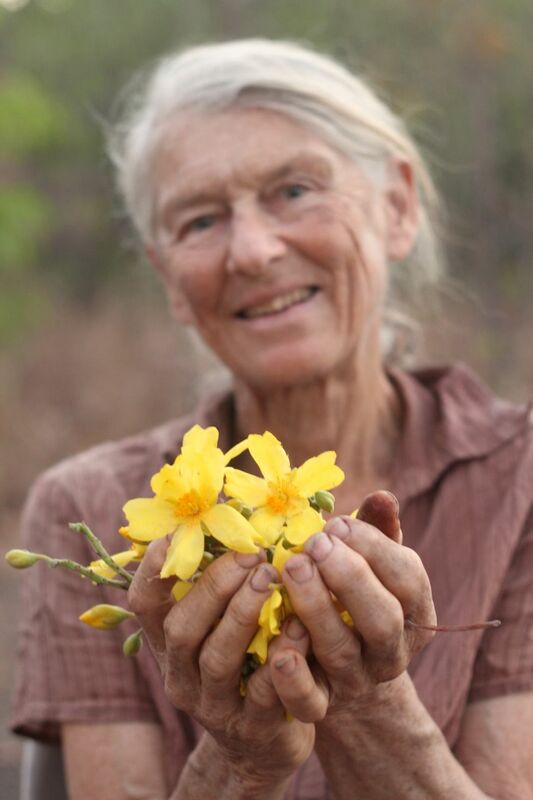 Emma had collected Syzgium fibrosum, which actually occur more in Arnhem land, but have often planted in landscaping. 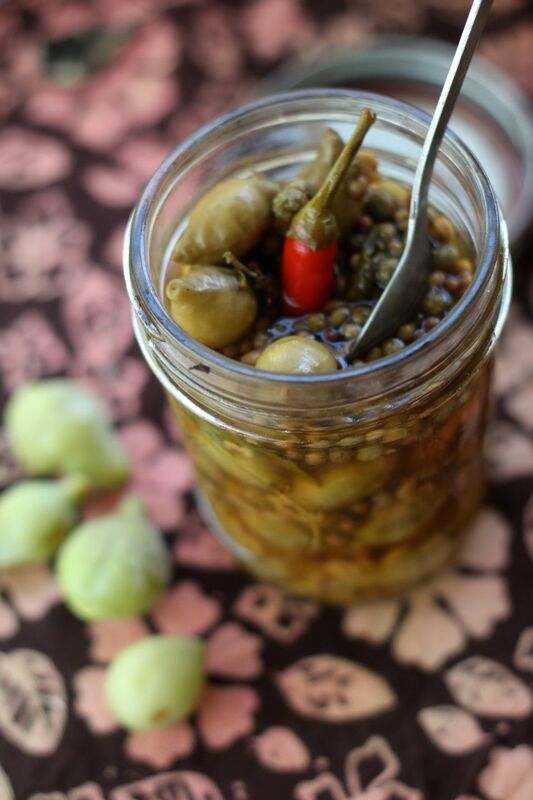 These sweet little fruits were added to pickled crab and also made into a sweet sauce by simmering with sugar and having as a great side sauce. 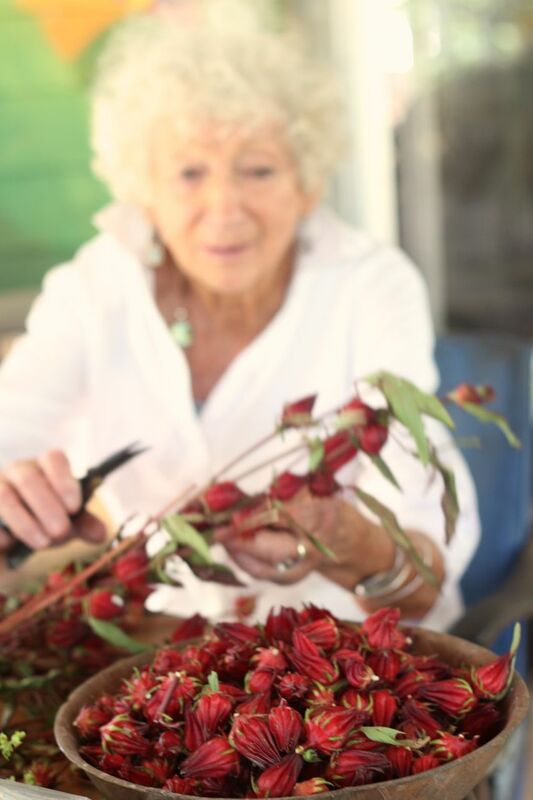 Wild Rosella (yes kind of a weed) was bought along for cutting and preparing, but also some premade jam was bought along. The Rosella was actually collected in some remnant bushland in the Howard River region in some disturbed areas. Kapok flowers which are currently in flower were added to dishes. 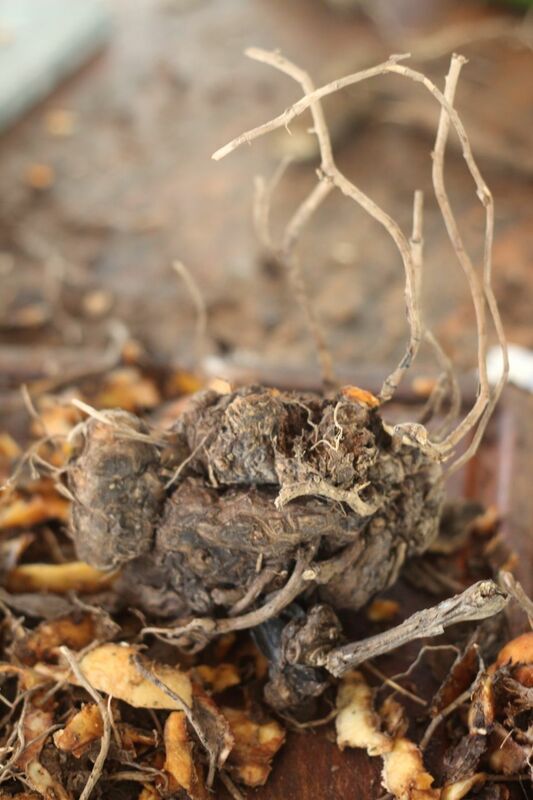 Water Lilly roots (Nyphaeae sp.) harvested that morning from our friend’s dam, were skinned and chopped up to go with the cooked crab. Some backyard egg and lemon mayonnaise was also made to go with it. 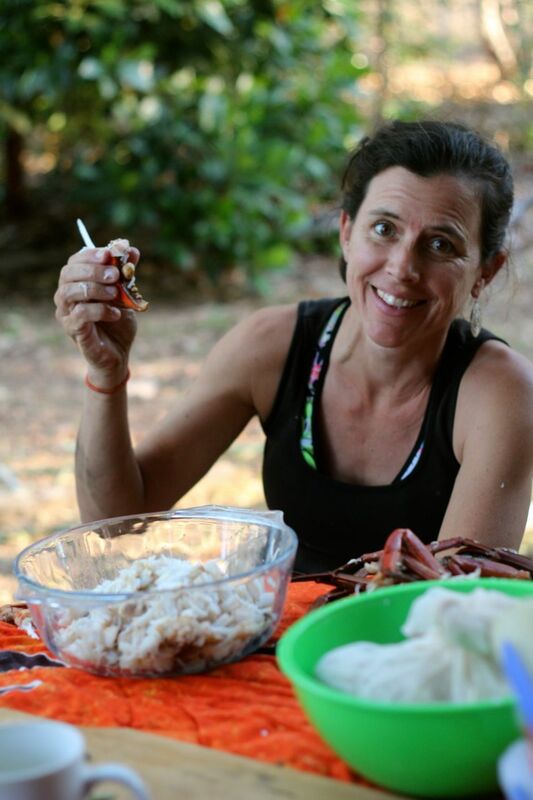 Some crab was also pickled with lemongrass, vinegar, ginger, a little chilli and Syzygium fibrosum, which Emma had harvested that morning. 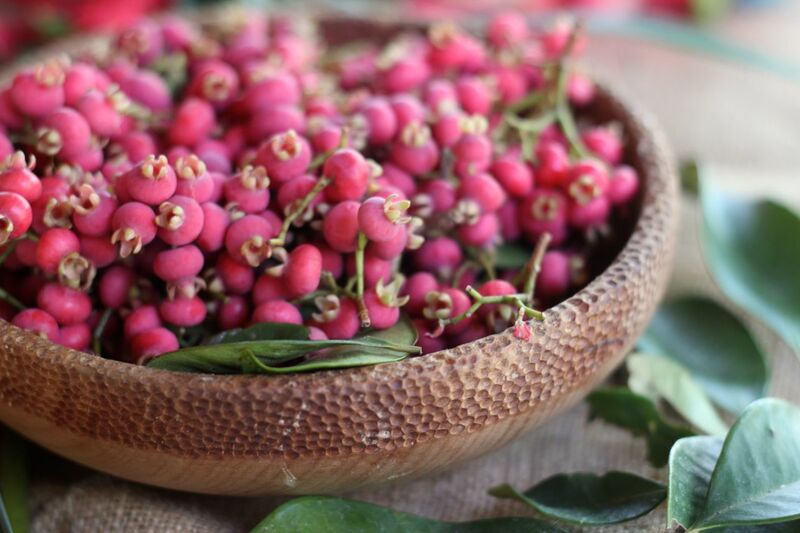 This Lilly Pilly is found in Arnhem Land and is very tasty and is now grown in many gardens and for landscaping, so can be ‘foraged’ from in more Urban areas. Steaming and then de-shelling the crab was quite a task! 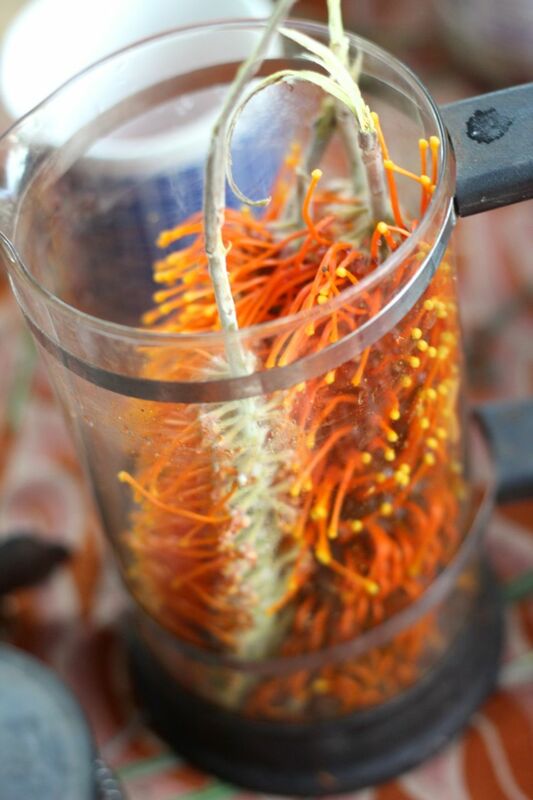 Grevillea flowers from the Fern Leaf Grevillea (Grevillea Pteridifolia) were made into a delicious malty sweet drink, just by adding boiled water from the fire. 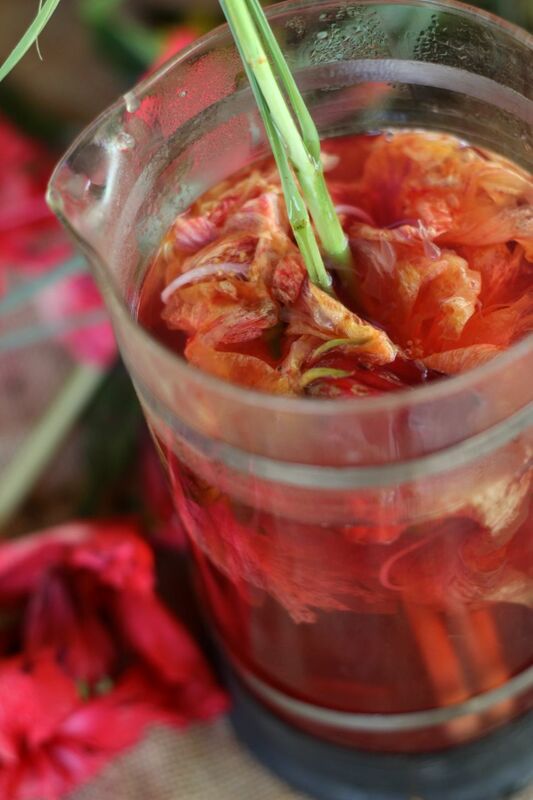 We also made some Hibiscus, lime and lemongrass tea, not native but also could be served in combination with the Grevillea.. The gathering was held on Liz ‘s 30 acre property in Darwin river , which she manages as Land for Wildlife and is all intact, beautiful native woodland (and completely weed free) This seemed a great setting for a wild food workshop and we are very grateful to her as we had to change locations at the last minute and she let us use her place and outdoor kitchen. It is also worth noting that all the plant species that seem tasty to humans support wildlife from insects to birds and mammals. 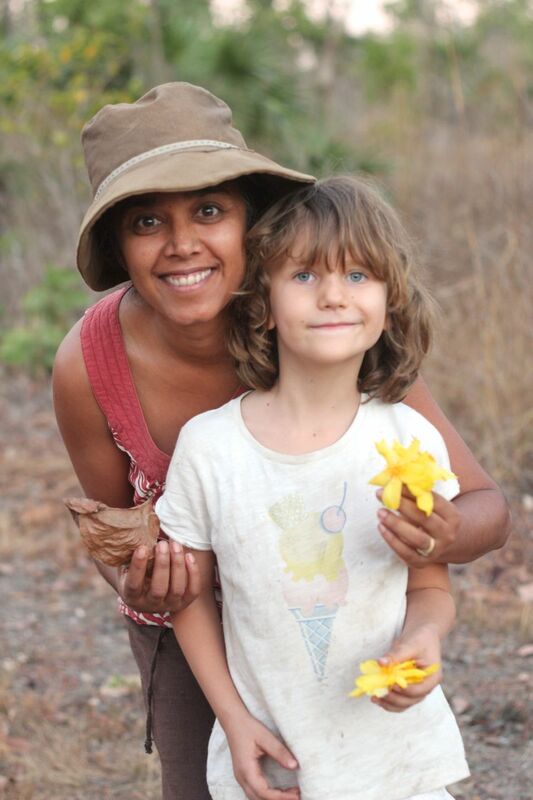 This workshop was just the start of many more wild food collecting and preparation experiences and the project hopes to host walks and workshops on particular bush tucker in the October/ November season for any interested others and involve Larrakia representatives. We will also cover each of these ingredients separately and feature focus pieces on them, so watch this space and we would love to hear from you if you cook with wild foods / bush tucker. My husband and I have an Indigenous Tidal Fishtrap at Glyde Point, N.THE, and we hope you may be able to help us to get a Market to sell our Longbum’s,periwinkle’s,mud Muscle ect, ect. We are going out this weekend and we would love to hear from you soon. Kindest Regards Vicki & Dookie Bonson. Our number is. 0438857915. Or. 0447974346. Hope to hear from you soon. Hi Vicki, so sorry I did not reply- I will text you! Do you have an email address? Do you have buyers/ and or collecting permit if required?